Hello Friends! Can you believe that it's the 25th of January already?! Well, you know what that means...it's time for a new Power Poppy digi and I have got a doozie for you! It's called Ruffled Wild Orchids and it's simply lovely. Let's take a look at what I did with it. I printed the image onto a piece of card stock and then cut it with my Brother ScanNCut2. I like to cut before I color because there is NOTHING worse than putting in time and effort to color an image and then watch it get sliced through by the electronic die cutting machine. ASK ME HOW I KNOW?! The image is colored with a combination of colored pencils; I used Polychromos, Prismacolors and pencils from Blick Studios. The image is mounted onto my card base with foam tape. I added a greeting from another Power Poppy digi set called Everything's Rosy. I sprinkled on a few sequins to add a little sparkle. And that is that. Please visit the Power Poppy blog to see the link list for my teammies. Thank you for visiting me today. 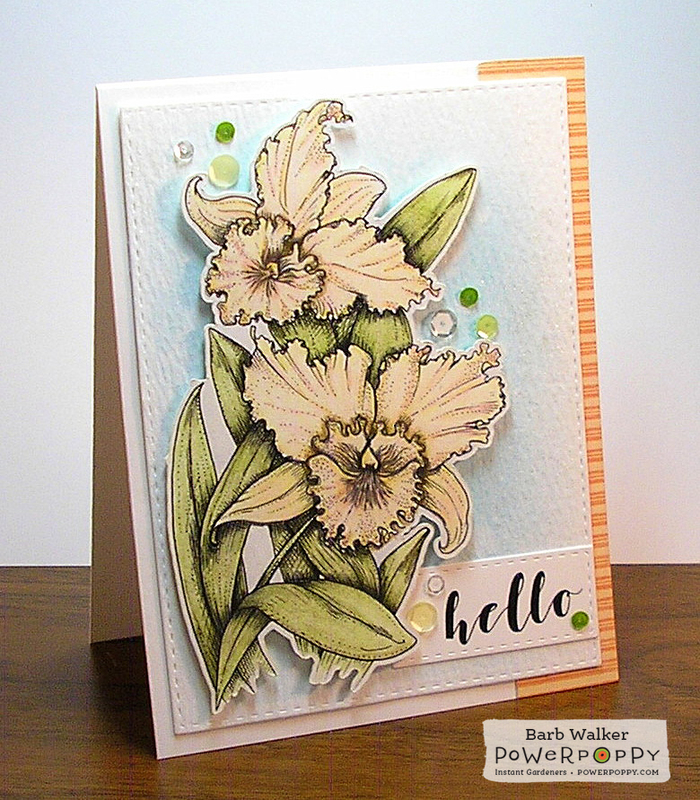 Barb, your creamy orchids are gorgeous! the dimension from cutting them really looks great against the blue background. Beautiful design! 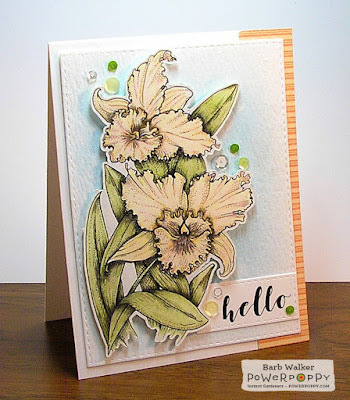 Sweet Barb, this is gorgeous with your beautiful coloring, and I love these orchids cut out and popped over the beautiful background! Very soft and beautiful with the sequins for some sparkle! Beautifully done, as always! Hugs! Just amazing your color pallets in pencils are always so stunning! Love your cut image and it's sky blue background behind! Pinning! Beautiful! Oh I like that you cut around the blooms one of my favorite things to do. Wonderful soft coloring with the pencils. Beautiful card. This is so soft and lovely! Excellent work!! I agree about cut first, prepare artwork second. I've even had that problem with the Cuttlebug and metal thin cuts. Oh Boy! Such fabulous coloring, Barb! I LOVE your pale yellow orchids! !